One interest, among Dard Hunter’s many pursuits while at the Roycroft, was ceramic design. 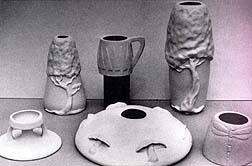 In 1905-1906 he made the prototypes for 6 pieces of pottery. Each piece was signed and given a mould number. Whether or not his intention was to be able to market this pottery through Hubbard, or if this was a purely experimental endeavor, we do not know. However, there are only 10 original pieces known to exist, suggesting that the latter is more likely. The Metropolitan Museum of Art has 6 of these pieces in their collection. Once the prototypes were made, Dard produced one mould for each design. We have recently discovered four of these original moulds in the archives of the Mountain House along with the original glaze recipe for a mat green glaze. 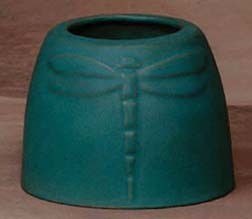 Using these moulds of the candle holder, tree vase, tree mug and dragonfly vase, we have cast 50 of each design in porcelain and applied a mat green glaze very similar to the original formula.